The fifth China International Machine Vision Exhibition and Machine Vision Technology and Application Conference (Vision China 2008), will be held on 25-27 November 2008 at the China International Exhibition Center, Beijing. 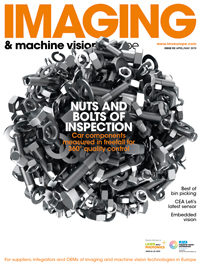 A machine vision market study, published by the Automated Imaging Association (AIA), reports that machine vision and automated imaging continues to be a growth industry in North America. Adimec, a leading supplier of high-performance digital cameras and camera lens assemblies, has appointed Andries Hofman as its chief executive officer. Automatica 2008, the 3rd International Trade Fair for Automation, is expected to expand on 2006's exhibition. The event takes place on 10-13 June 2008 at the New Munich Trade Fair Centre in Munich. Moritex has launched 'See more! ', a new newsletter dedicated to providing information about new and interesting components designed to help engineers and scientists achieve an optimised solution for their vision application. Applied Vision (AVC) has announced the promotion of Bud Patel to vice president of sales. Patel will be responsible for the entire global sales operation at AVC. The EMVA will hold its 6th European Machine Vision Business Conference in Berlin, Germany this year. Taking place on 11-12 April 2008, the conference will bring together business leaders and technical experts within the machine vision industry. Leutron Vision will host a meeting of companies currently pioneering the progress of GenICam and GigE Vision. The event will take place on 7-9 April 2008 in Pilsen, Czech Republic. Flir Systems has secured multiple delivery orders totalling $57.7 million from the US Army Space and Missile Defense Command in Huntsville, Alabama. Basler Vision Technologies has announced an 18 per cent increase in sales turnover for its Components business unit in the 2007 fiscal year compared to figures for 2006.